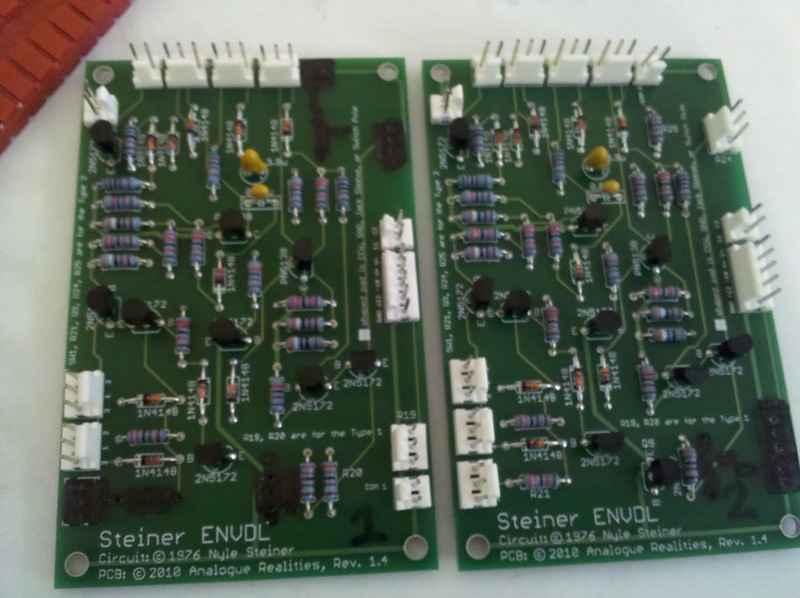 The Synthasystem's Triple Envelope Generator uses three PCBs (not counting the power regulation one). The first two EGs use these ENVDL boards, while the third uses the ENVDT board. I'll get into the specifics of the EG in more detail at a later time (i.e. when I finish the module), but basically, the first two EGs are nearly ADSR, although Decay and Release are controlled by the same knob. With a short trigger input, they act as AD envelopes. Both of them also have an overall level control, Damping and "Quathin" switches (for slightly different behaviors), and switches to combine their output with the third EG. The second EG also features a switch to change the Attack control to be a delay control (with a near instantaneous attack). Here's the two boards. As you can see, I've marked them "1" and "2", and crossed out the parts to be omitted for the two variants. Perhaps it isn't super pretty, but I find it useful when stuffing them, and checking them over later. One of the MTA connectors is for a connection to the ENVDT board for the switchable combined 1+3 and 2+3 EG outputs. I'll cover the ENVDT board tomorrow. In the meantime, I finished up my power supply over the weekend (just a couple tweaks before I present it here), and the panels for the Noise, Phase Shifter, Ring Modulator, and Peak Selector are scheduled to arrive on Wednesday!